Trail in fog or bad weather. Carry ample extra clothing, and, if weather becomes threatening, promptly descend to shelter by the shortest route." 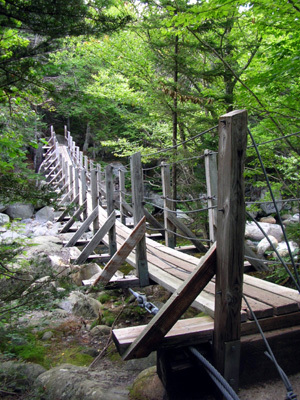 One of the few bridges I've seen over creeks and rivers in NH; this one is over the West Branch of the Peabody River. So guess where I was today and guess what happened?? Yesterday's quote re: doing this section on a rainy Wednesday to avoid the crowds wasn't so funny today. I found out exactly how rapidly storms build up in the Presidential Range and how you can't always rely on the weather forecasts from the Mt. Washington observatory. When I checked the board at 7 AM at the Pinkham Notch Visitor Center, there were no warnings about what I was to encounter at the top of nearby Mt. Madison, a full 925 feet lower (elev. 5,363 on the highest rock) than the notorious Mt. Washington. I chose to do the 13.8-mile section of the northern Presies backwards (southbound) because there is a precipitous drop of about 2,000 feet in only one mile coming off the eastern side of Mt. Madison. 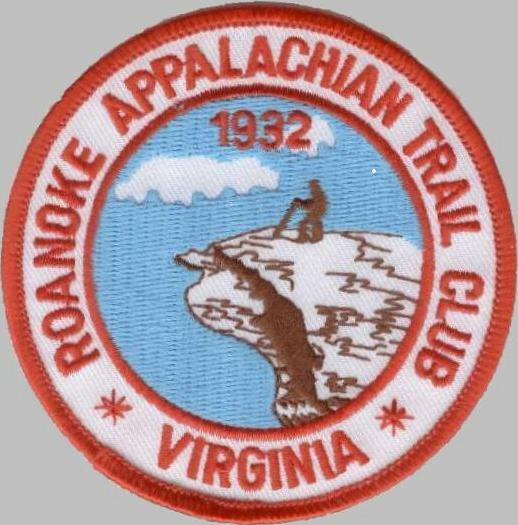 Thru-hikers have called it the worst drop yet as they are headed northbound on the AT. Because of my Granny Knees, it's easier for me to climb those grueling ascents than to descend. It may take me a while but I'm a pretty steady climber. So the plan was to start at Pinkham Notch/NH 16 and end at Mt. Washington as I did yesterday. Jim would have to drive up there and pay eighteen bucks again for the privilege, but it was the only way we could figure out how to break up this section. The weather prediction for the valley was for "partly sunny weather and a chance of showers in the afternoon." On the way to Pinkham Notch it was partly sunny. We could see clouds hanging over some, not all, the mountains but we couldn't tell anything about rain up there. We passed a boggy pond area near the visitor center and I commented, "That looks like a great place to spot a moose." Turns out, the Pinkham Notch area is a good place to see moose. Did you know you can take a moose tour around here? No need to get messy hiking on a trail to spot a moose! Several companies in the region have three-hour narrated van rides that travel roads where moose are frequently seen. I checked the weather board inside the visitor center and saw the forecast for 50 degrees and up to 50 MPH gusts on Mt. Washington. There was a chance of showers, but no mention that it might already be raining up there. So I went on up the Trail to Mt. Madison. 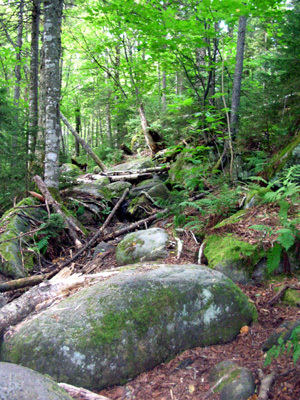 In NH the AT follows many old trails that pre-date it. 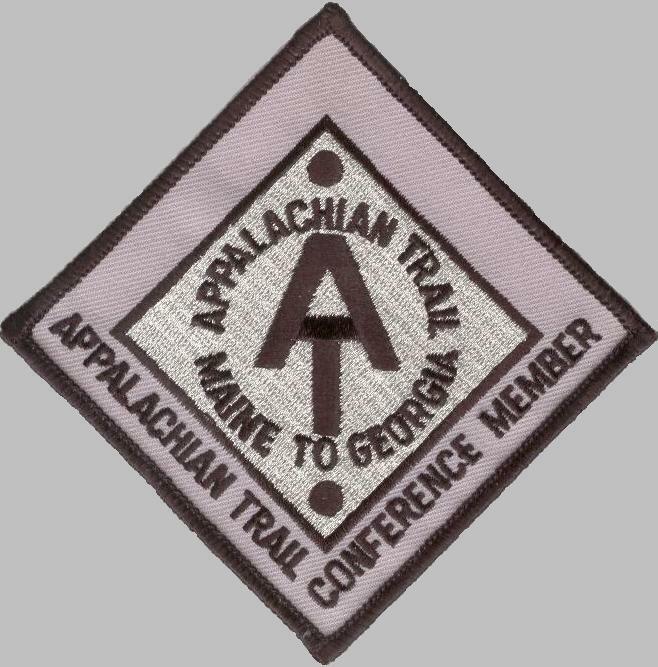 They all have different names so I have to be very careful to look for the AT symbol or someone's hand-printed "AT" at every intersection to be sure I'm on the correct trail. White blazes aren't as common here as in other states, either, and sometimes I have to follow yellow markers on cairns. I started out on the Tuckerman Ravine Trail, turned onto the Old Jackson Road (which looked like the gnarly "trail" in the photo above! ), then the Madison Gulf Trail, the Great Gulf Trail, Osgood Cut-Off, Osgood Trail, and later the Gulfside Trail mentioned in the warning above (it's on the ridgeline of Mts. Madison, Adams, and Jefferson). The first five miles were gently up and down, with a net gain of 500 feet. The Trail was difficult to walk, let alone run. Apparently this is a major drainage area for Mt. Madison because I swear I crossed at least thirty little and big creeks and one river in this section. The only one with a bridge was the West Branch of the Peabody River (thank goodness). I wouldn't advise doing this section after a large rainfall when the creeks are high. I soon wished I'd taken both trekking poles today for the creek crossings. One is OK but two give me more stability in creeks. I don't rock-hop unless the rocks are large and flat. I've fallen off rounded rocks too many times to risk it. I'd rather go through the water than fall in and get hurt or ruin my camera or cell phone (I usually remember to put them in baggies when I go through water, but not always). Just twenty-five minutes into my hike (no running until the end today) I heard a rustling in the woods to my right. I stopped to see if it was a deer. No, much better: three moose were about twenty feet away, foraging for breakfast!! First, one little head popped into view. "Aren't you a cutie?" I said softly. Then a second little head looked curiously at me. Then a BIG head appeared behind them. Mama Moose! They very slowly moved away from me, not disturbed much by my presence. As close as they were to the Trail, they're obviously used to hikers going by. They were more of a curiosity to me than I was to them. Unfortunately, the photo I hurriedly took doesn't show them clearly enough to post here; it's worse than the fuzzy bear picture I took. I called Jim excitedly to tell him about my second moose sighting (the first was on my first day in Vermont). That was the last time I had any fun all day. About two miles in, who should I see coming toward me but "Charlie Brown" and "Steady Eddy!" They're the other part of the original "Good, Bad, and Ugly" trio I mentioned when I talked about "Little John" a couple days ago. The last I saw them was at Harpers Ferry. They immediately recognized me (despite the shorter hair now) and we talked a few minutes. Like Little John (who was misnamed "The Ugly"), they're carrying full packs now through the Whites and will resume using their vehicles to slack-pack when the terrain eases up. (It will, won't it??) They told me they hiked over Lafayette on Wednesday, the rainy day when I had such a lousy time on Kinsman Ridge. It was worse on Lafayette because of that two-mile exposed ridge. They told me they'd just come over Madison and it was a little foggy and windy up there, but they didn't seem concerned that I was headed that way. I know they would have warned me if the conditions were bad. After five miles the Trail turned steeply up. I climbed from 2,500 feet to 4,500 feet (above tree line) in only one mile. Very tough, but I was glad to be going up and not down. In this section I saw about six hikers coming down, all bundled up. The higher I got, the colder it got. They warned me about high winds on Madison. I was comfortable in a lightweight short-sleeved shirt and silky running shorts; they were dressed in rain pants and jackets. They were wet from rain. I was wet with sweat from the effort of climbing this steep part of the Trail. As I neared timberline I could see that the mountain was covered with a cloud. It began to rain just as I ran out of trees. I went back into the trees to get out of the worst wind and put on my Marmot Precip jacket and pants, a fleece cap, and gloves. I was over-dressed yesterday and didn't take a long-sleeved shirt today. But I stayed warm enough in this gear despite what happened in the next couple hours. That's how long it took me to get another mile and a half, up and over Mt. Madison's many little rocky peaks and down to the Madison Springs Hut. I still had to climb another 1,163 feet to the summit. This became the most precarious situation I've encountered on the AT. The wind was blowing hard. Some gusts about blew me over so I'd have to crouch down to have less of my body exposed to the wind. It was raining, but not too hard. I stopped taking photos and concentrated on survival and getting to the hut. The fog was constant. At times it was difficult to see the rock cairns ahead. There is no trail here. You just hop from rock to rock (all covered in green lichen that gets slick when wet) as best you can, keeping the cairns in sight so you don't get lost. The boulders got larger and larger. Some were the size of cars. I'd go around those when possible to reduce the effort required. There is no exposed soil on this peak. Hikers told me the rest of the ridge to Mt. Washington is similar: just a big boulder pile for five or six more miles. I knew there was a "bad weather" route around the peak of Madison called the Parapet Trail. I thought that it was below tree line and I'd missed it. But I found a trail by that name above tree line and a hiker was coming off of it. We talked. He said this trail was no better than going over the peak and it was longer to get to the hut (the AT and Parapet Trail converge there). The sign confirmed that: it was a little shorter going over the mountain on the AT. The hiker said the Parapet Trail was very rough, over the same rocks I was on, and wasn't blocking the wind as it usually does. He didn't recommend it as an alternate. I stood and thought about my choices a little while. I had less than a mile to get to the hut on the white-blazed route. I still had to climb up higher, where it might be even more windy. Rain was turning to sleet in the colder air, further hindering my progress that way. What if a bunch of snow fell? But the other options weren't pretty, either. I'd come too far to return the way I came up and it would be a hellacious drop to go back down that way (it's why I was going SOBO today!). I didn't see any side trails going down the mountain on either side and the other hiker didn't recommend the Parapet Trail. The best of three lousy options at this juncture seemed to be up and over Madison. I also knew I was going too slowly to make it to Mt. Washington before the auto road closed for the night. Once I reached the hut I would have to evaluate my options again and let Jim know before he headed up to Mt. Washington to get me. I had to call him soon. That propelled me back into action. It's hard to describe the next hour and a half, the time it took me to cover nine-tenths of a mile to the hut. It seemed like an eternity. Survival was my main focus. The rocks were slick. I had to proceed very slowly so I didn't fall. There were no other hikers to help me if I got hurt and I didn't know if my phone would work in an emergency. By the time I reached the summit the sleet was sticking to the rocks, forming ice. Now I had to go down 500 feet on icy rocks to get to the hut, which I couldn't even see in the fog. It was very windy. 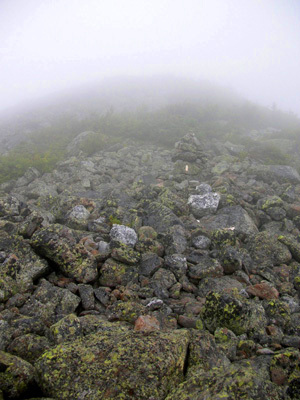 Occasionally, the clouds would thin out so I could see several cairns ahead. I never could see into the valley. Probably just as well. I felt like I was all alone in the stratosphere - and I was. No one else was stupid enough to be up there! The only thing missing from this worst-case scenario was lightning. I've been under similar conditions once before, about a mile from the summit of Pike's Peak. It started sleeting, then I heard lightning and thunder. This is pretty risky at 13,000 feet on exposed rock (today's understatement)! However, on Pike's Peak I found a rock overhang where I could huddle for half an hour to let the storm pass. I about froze but it beat being a lightning rod. This time there were no rocks to hide under. I would have been in worse shape if I'd stopped a while on Madison anyway, because the ice was only getting worse. I finally reached the Madison Springs hut a little before 1 PM. What a welcome sight! About twenty hikers were hunkered down inside. My immediate concern was not hot soup (offered free by the "croo"), but notifying Jim not to go up Washington to wait for me. I tried to call him on top of Madison but his phone wouldn't ring down in the valley (of course, I had a signal 'way up high!). The staff was very helpful. They had no phone but could radio a message to the visitor center on top of Mt. Washington in case Jim got there and wondered where I was. I didn't seriously consider staying at the hut overnight because I knew rain was predicted the rest of the week. I didn't want to risk being stuck there for days if it snowed heavily at that elevation. So I asked about the fastest way down to the valley where Jim could pick me up. Turns out the trail the staff uses to get up and down is Valley Way, a 3.7-mile trail off the north side of the mountain to Hwy. 2 (I'd come up from Hwy. 16 to the east). Great! That was closer to our campground anyway. Now all I had to do was let Jim know my plan. Thank goodness I was finally able to reach him from the hut! He wrote down the name of the trail and the parking area (Appalachia). Not knowing how bad the trail was, I estimated three hours for that 3.7 miles. There was a thermometer on the outside of the hut next to where I stood to call Jim. It read 37 degrees. That was at 4,800 feet, where it was raining, not sleeting. The wind was much less ferocious there than at the top of Mt. Madison. Imagine how cold it was up there to be forming ice, even without factoring in the wind chill! The Valley Way Trail was so much more civilized than any others I've hiked in the Whites. Now what's with that? Why is the AT so damn gnarly and a side trail down the very same mountain is mostly runnable?? It wasn't even very steep, so totally different than the trail on which I ascended Mt. Madison this morning. It still took me a little over two hours to descend because of slick rocks and stops to talk with hikers going up. It would be much quicker on a dry day. I'll have to go either up or down it once more when I complete this section. I didn't see that warning going up the AT on the east side but I have certainly read the warning before. They even have a list of the people who have died in the Whites posted in the visitor center on Mt. Washington! 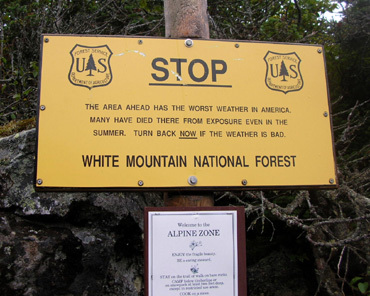 That's a pretty graphic reminder of the dangers inherent in the Presidential Range. As I dropped lower, I encountered about thirty hikers heading up, some carrying absolutely nothing, not even water. It was very warm and muggy in the valley and they had no clue what was happening three miles up the trail. They probably thought I looked funny in my wet jacket and pants, still bundled up - just the reverse of the situation this morning as I was climbing the AT toward Madison, wearing my lightweight running clothes as hikers descended in cold-weather gear. Halfway down I stopped to take off my jacket, pants, hat, and gloves. Although I never was cold on top I could have gotten hypothermic if I'd been up there much longer than I was. Some of the people I saw going up obviously ignored this sign. Hopefully, they were just going part way up to see several falls along the lower portion of the trail. It was good to see Jim. I was so concerned about not connecting with him by phone. Although it was raining in the valley (at least it wasn't sunny there like last Wednesday! ), he had no clue how bad it was up on the ridge or he would have been worried sick about me. After today's dangerous experience he's fully aware of my fear of going out into these mountains when it's raining. It's a good thing I didn't fool-heartedly continue on to Mt. Washington, not only because of the increasing danger as I climbed even higher than I was on Madison, but we found out later that the road to the summit was closed halfway up. Jim couldn't have gotten to the top this afternoon if he tried! I wouldn't have had anywhere to stay there and would have had to walk four to eight miles down the auto road. As it is, I got in 3.7 bonus miles today that will have to be repeated in one direction or another when I complete this section. I have a little over five miles of the AT to cover between Madison Springs hut and the summit of Mt. Washington. I'll probably do it northbound so Jim can drop me off on top in the morning when we know the road is open and the summit is clear. It'll be mostly downhill from there, but there aren't any seriously steep grades I'm aware of. The "trail" is all boulders, though, and I don't want to do this section until a sunny day when the rocks are pretty dry. In retrospect, I'm not sure what I should have done differently. I neglected some safety procedures but did some other things right. Perhaps I should have gone back down the way I came up from Pinkham Notch. But I'd come so far and hated the thought of going down that horrible descent I'd gone up to avoid in the first place. That way would also have taken me longer, I now see. 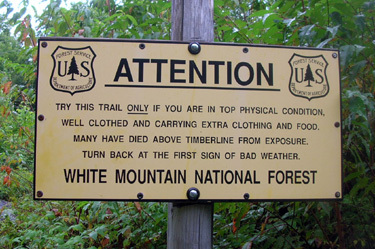 Most importantly, I should be hiking with someone through the Whites. I don't know how to do that. Hikers are very spread out now and may not be going fast enough for me to finish a section before dark. I want Jim to go with me through the Mahoosic Notch coming up in the fourth segment from now, as I might need help getting through that very difficult section (hikers say there are some places so narrow to climb up and crawl under that I have to take off my small pack to get through). I was right to check the weather board at the visitor center. I had enough clothing on today for the time I was exposed on the ridge, and I had food and fluids left over. But if I'd been out overnight or gotten hurt and couldn't move, I'd probably be a statistic by now due to exposure. I should have had more warm clothes with me, a bigger light than the Photon microlight, and a space blanket to wrap up in. I do have other items with me all the time, like a whistle, mirror to flash signals, and waterproof matches (like they'd be helpful above tree line!). I lucked out today, despite my stubbornness to keep moving forward. I was extremely fortunate to reach Jim by phone so he wasn't frantically trying to find me. Our cell phones have been indispensable during this trek and they have worked more times than not. 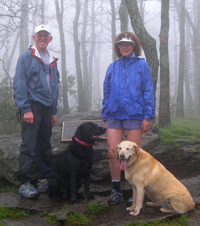 Some hikers object to the use of cell phones on the Trail. I respect that and try to be out of anyone's earshot when I use my phone. But it is a necessary emergency tool for me. Today made that perfectly clear. I'm pretty shook up tonight. I'm definitely taking off one or more days to rest and regroup. I haven't taken a rest day for ten days since I've been doing less mileage. The Whites have taken their toll on me. My knees are sore, my brain is tired from the intense focus required each day, and I haven't been sleeping well. I'm trying so hard to get done, and the Trail just keeps getting tougher and tougher. Rain is predicted the next three or four days, including a potential deluge from the remnants of Hurricane Katrina, heading now for the LA/AL coast with Category 5 winds. Once those things hit land they move quickly north and east and can cause flooding and havoc in the entire eastern USA. I don't need to face any flooded creeks or washed out bridges or roads that Jim needs to use to get me. The next few days should be interesting . . . at least we're stuck in an interesting area (Gorham) to explore if we want to get out in the rain. Stay tuned. Next up, photos and an entry about the popular hut system in the Whites. Now I have time to get caught up on several days' journal entries!